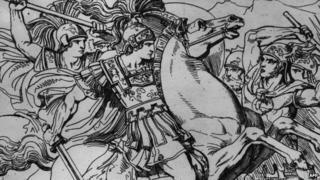 Alexander the Great is portrayed as a legendary conqueror and military leader in Greek-influenced Western history books but his legacy looks very different from a Persian perspective. Any visitor to the spectacular ruins of Persepolis - the site of the ceremonial capital of the ancient Persian Achaemenid empire, will be told three facts: it was built by Darius the Great, embellished by his son Xerxes, and destroyed by that man, Alexander. That man Alexander, would be the Alexander the Great , feted in Western culture as the conqueror of the Persian Empire and one of the great military geniuses of history. Indeed, reading some Western history books one might be forgiven for thinking that the Persians existed to be conquered by Alexander. A more inquisitive mind might discover that the Persians had twice before been defeated by the Greeks during two ill-fated invasions of Greece, by Darius the Great in 490BC and then his son, Xerxes, in 480BC - for which Alexander's assault was a justified retaliation. But seen through Persian eyes, Alexander is far from "Great". He razed Persepolis to the ground following a night of drunken excess at the goading of a Greek courtesan, ostensibly in revenge for the burning of the Acropolis by the Persian ruler Xerxes. Persians also condemn him for the widespread destruction he is thought to have encouraged to cultural and religious sites throughout the empire. The emblems of Zoroastrianism - the ancient religion of the Iranians - were attacked and destroyed. For the Zoroastrian priesthood in particular - the Magi - the destruction of their temples was nothing short of a calamity. The influence of Greek language and culture has helped establish a narrative in the West that Alexander's invasion was the first of many Western crusades to bring civilisation and culture to the barbaric East. But in fact the Persian Empire was worth conquering not because it was in need of civilising but because it was the greatest empire the world had yet seen, extending from Central Asia to Libya. Persia was an enormously rich prize. Look closely and you will find ample evidence that the Greeks admired the Persian Empire and the emperors who ruled it. Much like the barbarians who conquered Rome, Alexander came to admire what he found, so much so that he was keen to take on the Persian mantle of the King of Kings. And Greek admiration for the Persians goes back much earlier than this. Prof Ali Ansari is one of the world's leading experts on Iran and its history. He presents Through Persian Eyes - a three part series on BBC Radio 4 exploring world history from a Persian perspective. "Cyrus was able to penetrate that vast extent of country by the sheer terror of his personality that the inhabitants were prostrate before him…," wrote Xenophon, "and yet he was able at the same time, to inspire them all with so deep a desire to please him and win his favour that all they asked was to be guided by his judgment and his alone. "Thus he knit to himself a complex of nationalities so vast that it would have taxed a man's endurance merely to traverse his empire in any one direction." Later Persian emperors Darius and Xerxes both invaded Greece, and were both ultimately defeated. But, remarkably, Greeks flocked to the Persian court. The most notable was Themistocles, who fought against Darius's invading army at Marathon and masterminded the Athenian victory against Xerxes at Salamis. Falling foul of Athenian politics, he fled to the Persian Empire and eventually found employment at the Persian Court and was made a provincial governor, where he lived out the rest of his life. In time, the Persians found that they could achieve their objectives in Greece by playing the Greek city states against each other, and in the Peloponnesian War, Persian money financed the Spartan victory against Athens. The key figure in this strategy was the Persian prince and governor of Asia Minor, Cyrus the Younger, who over a number of years developed a good relationship with his Greek interlocutors such that when he decided to make his fateful bid for the throne, he was able to easily recruit some 10,000 Greek mercenaries. Unfortunately for him, he died in the attempt. Soldier, historian and philosopher Xenophon was among those recruited, and he was full of praise for the prince of whom he said: "Of all the Persians who lived after Cyrus the Great, he was most like a king and the most deserving of an empire." There is a wonderful account provided by Lysander, a Spartan general, who happened to visit Cyrus the Younger in the provincial capital at Sardis. Lysander recounts how Cyrus treated him graciously and was particularly keen to show him his walled garden - paradeisos, the origin of our word paradise - where Lysander congratulated the prince on the beautiful design. When, he added, that he ought to thank the slave who had done the work and laid out the plans, Cyrus smiled and pointed out that he had laid out the design and even planted some of the trees. On seeing the Spartan's reaction he added: "I swear to you by Mithras that, my health permitting, I never ate without having first worked up a sweat by undertaking some activity relevant either to the art of war or to agriculture, or by stretching myself in some other way." Astonished, Lysander applauded Cyrus and said: "You deserve your good fortune Cyrus - you have it because you are a good man." Alexander would have been familiar with stories such as these. The Persian Empire was not something to be conquered as much as an achievement to be acquired. Although Alexander is characterised by the Persians as a destroyer, a reckless and somewhat feckless youth, the evidence suggests that he retained a healthy respect for the Persians themselves. Alexander came to regret the destruction his invasion caused. Coming across the plundered tomb of Cyrus the Great in Pasargad, a little north of Persepolis, he was much distressed by what he found and immediately ordered repairs to be made. Had he lived beyond his 32 years, he may yet have restored and repaired much more. In time, the Persians were to come to terms with their Macedonian conqueror, absorbing him, as other conquerors after him, into the fabric of national history. And thus it is that in the great Iranian national epic, the Shahnameh, written in the 10th Century AD, Alexander is no longer a wholly foreign prince but one born of a Persian father. It is a myth, but one that perhaps betrays more truth than the appearance of history may like to reveal. Like other conquerors who followed in his footsteps even the great Alexander came to be seduced and absorbed into the idea of Iran. Ali Ansari is a professor in modern history and director of The Institute of Iranian Studies at The University of St Andrews, Scotland.